Thursday, February 20 1908 -- Battling Nelson, coming off a string of losses, is desperate to have a win under his belt, especially against Jimmy Britt, who has beaten him twice. He begins his serious training a scant two weeks before the fight, finally laying off the high life. His sparring partner, Kid Dalton, finally has to earn his keep. In the saga of the weasel hat crack, Hen Berry has now apparently gone so far as to accuse Mayor Harper of having started the rumor. Ralph Oswald Yardley was born in Stockton, California on September 2, 1878, according to his World War I and II draft cards. In the 1880 U.S. Federal Census, he was the youngest of three children born to John and Caroline, both English emigrants. The family lived in Stockton on Sonora street. His father was a grocer. Who Was Who in American Art (1985) said he studied at the Mark Hopkins Institute of Art. The San Francisco Call, in its August 22, 1895 edition, reported the upcoming fall term of the Mark Hopkins Institute of Art. The article "Art in Studios Again" mentioned Yardley as one of the students. In the 1900 census he lived in Honolulu, Hawaii on Punchbowl. His occupation was reporter. The newspaper Fourth Estate said, on January 28, 1922, "…Mr. Yardley started his career on the San Francisco Examiner, later going to the Chronicle. He was for two years staff artist of the Honolulu Advertiser, returning to the San Francisco Chronicle in 1902. Three years later he joined the staff of the New York Globe, returning to the coast to become manager of the art department of the San Francisco Call. For more than three years he did free lance magazine cover work in New York for Harper's, Leslie's and other national periodicals…." In 1903 the Crocker-Langley Directory listed him as an artist at the Bulletin and his residence at 791 Sutter Street. That same year the San Francisco Bulletin published his strip The Adventures of Ping and Pong. The 1910 census recorded him in Manhattan, New York City at 115 East 34th Street. He was an artist. Yardley signed his World War I draft card on September 12, 1918. He lived in Stockton at 729 North Centre Street, and was a self-employed artist. His description was medium height and build with brown eyes and hair. The Fourth Estate said, "…During the war he became a part of the liberty loan organization for the twelfth federal reserve district with headquarters in San Francisco. 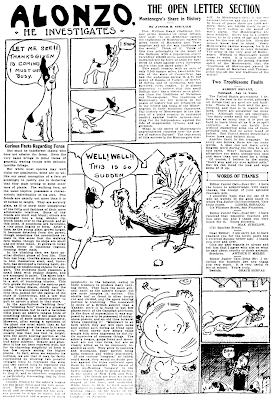 In 1919 Mr. Yardley opened a commercial studio in San Francisco and supplied the Bulletin a cartoon daily for its editorial page until several weeks ago when he left to join the Stockton Record." San Francisco, April 16.—Miss Carmen Glauch of 2728 Golden Gate avenue, daughter of Herman Glauch, prominent literary worker, was married to Ralph Yardley, nationally known cartoonist and Liberty Loan artist, this morning by Rev. J.W. Lundy of the Howard Presbyterian church. Yardley started his career as cartoonist on San Francisco newspapers. For two years he was on the art staff of the New York Globe. Recently he has been working with the publicity committee of the Victory Liberty Loan committee of the Twelfth Federal Reserve district, preparing art work for the present campaign. Mr. and Mrs. Yardley left at noon for a short honeymoon, after which they will make their home in San Francisco. In 1920 the couple lived in San Francisco at 689 Third Avenue. His occupation was artist in photography. On January 28, 1922, the Fourth Estate said, "Ralph O. Yardley, well known newspaper and magazine artist, has returned to Stockton, Cal., the city of his birth, to join the staff of the Stockton Record…." In 1923 he received a patent for a headlight lens. The November 1927 issue of The Focus reported this amusing incident. Ralph O. Yardley, whose cartoons amuse readers of the Stockton Record is a resourceful photographer. Recently he went on a hike in the mountains with a friend and at the end of the first day realized he had not brought the slide for his Graflex magazine. Various ideas were suggested as to the removal of the magazine without spoiling the film. All were rejected till Mr. Yardley exclaimed, ''I have it—those pants of yours are black and closely woven. Remove them and I'll use them for a dark room." ''Wouldn't my shirt do, and what's the matter with your pants?" asked his surprised companion. "Your shirt is white and my pants are grey." And so—the improvised dark room saved the day. These are bare facts. The films were saved. In the 1930 census the couple and their two daughters lived in Stockton at 2230 Crafton Way. He was a cartoonist for a daily paper. On April 27, 1942, Yardley signed his World War II draft card. He lived in San Joaquin, California at 999 North Lincoln. Editor & Publisher reported his retirement on July 26, 1952. Stockton, Calif.—Cartoonist Ralph Yardley has retired from the Stockton Record after 57 years of newspaper work. 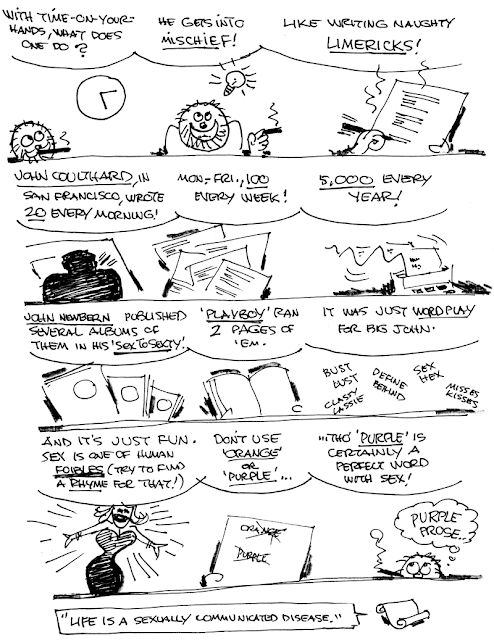 Mr. Yardley, now 73, was the Record's first cartoonist and has been on the staff for the past 30 years. Prior to his Record career, the artist drew for the San Fran­cisco Chronicle, San Francisco Examiner, San Francisco Call, San Francisco Bulletin, New York Globe and Honolulu Advertiser. His first job was with the Examiner. Yardley passed away on December 6, 1961, in San Joaquin, according to the California Death Index at Ancestry.com. At the Stockton Record he did a weekly feature called "Do You Remember?" from 1922 - 1952. I believe it was this feature that I saw in the 1960s being reprinted in the Stockton Record under the title "Bygones". 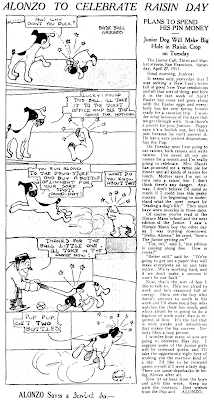 In 1908 the San Francisco Call, a real also-ran sorta rag in that city of great newspapers,decided to attract children to its Saturday issues with a kid's section. I guess their Sunday issue, which featured the Pulitzer Sunday funnies, was doing well, and so they decided to try to get the kids to annoy their parents for the Call two days a week instead of one. 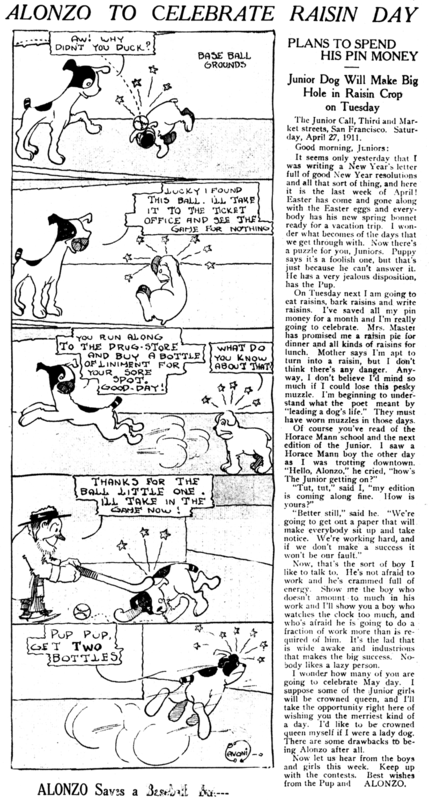 The new Saturday kids section, with spot color on the cover, featured a comic strip starring a dog named Alonzo, titled (at first) Have You Seen Alonzo?, and Ralph Yardley, who was apparently the head of the art department at the time, took on the task of drawing the weekly strip. Although the strip is no classic, and Yardley certainly didn't wrack his brain for days coming up with the gags, it seemed to appeal to the tykes, and Alonzo became the mascot and weekly front-page feature of the section. Yardley handled the strip for the first ten months, from October 10 1908 to June 12 1909, and then handed it off to a young and inexperienced kid named Paul Terry. Of course, Terry would someday go on to bigger and better things as the head of the Terrytoons studio, but at the time he was a wet behind the ears 22-year old with minimal drawing ability. 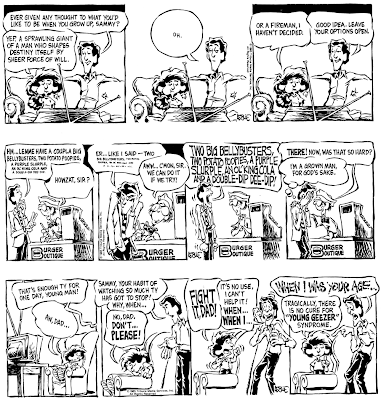 Charlie Judkins, whose blogpost alerted me to the existence of this feature (which can be read in its entirety in the digital Call available from the Library of Congress), tells me that Paul Terry recalled the strip in a 1970 interview. Sixty years later Terry's memory might have been just a bit hazy -- his recollection was that he did the strip for King Features after moving to New York. Did he revive the feature there after he left San Francisco? I tend to doubt it. I have no record of Terry creating any continuing series for Hearst, and certainly not for King Features, which didn't even exist until 1916. In fact I can find no reliable record of Terry working for Hearst at all. The Wikipedia entry for Terry says he worked for the New York Press, which it calls a Hearst paper. Nope, it wasn't. Any animation fans out there have anything to contribute on the subject? Paul Terry stayed on the feature for a little less than a year. His last strip was published on May 7 1910, and the next week there was a different cartoonist, but from the same family, taking over. John Terry had a much less distinguished career ahead of him than brother Paul, but at the time he carried on Alonzo with, if anything, greater competence than his brother. John didn't stay on the gig as long as his brother, less than two months in fact. 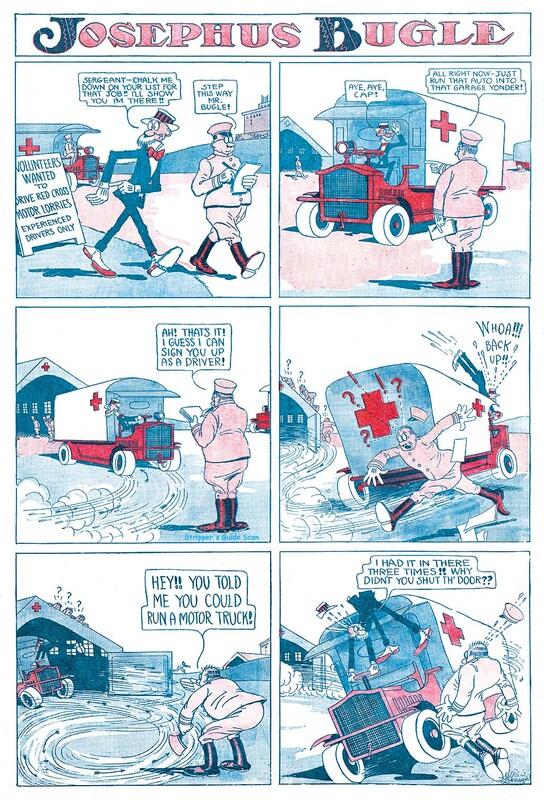 His last strip was on July 3 1910. Following him was a cartoonist named Mike Randall, another relative short-timer who only signed the feature until October 30 1910. Next up was a fellow who signed himself just 'Tam'. Tam wasn't altogether keen on comic strips, it seems, because under his stewardship Alonzo's adventures started to turn into illustrated stories. At some points Alonzo was reduced to barely more than a mascot. Tam stuck around for over a year, ending his tenure on February 24 1912. He was spelled once, on August 26 1911, by a guest cartoonist who ended up being the next one to take over the feature. Jim Navoni ran the show from March 2 to June 8 1912. After Navoni only one additional cartoonist signed the feature, and then only with his initials. Somebody named H.M. stuck around for three months, ending on September 28 1912. [HM has now been identified as Herbert Morton Stoops -- thanks Charlie!]. 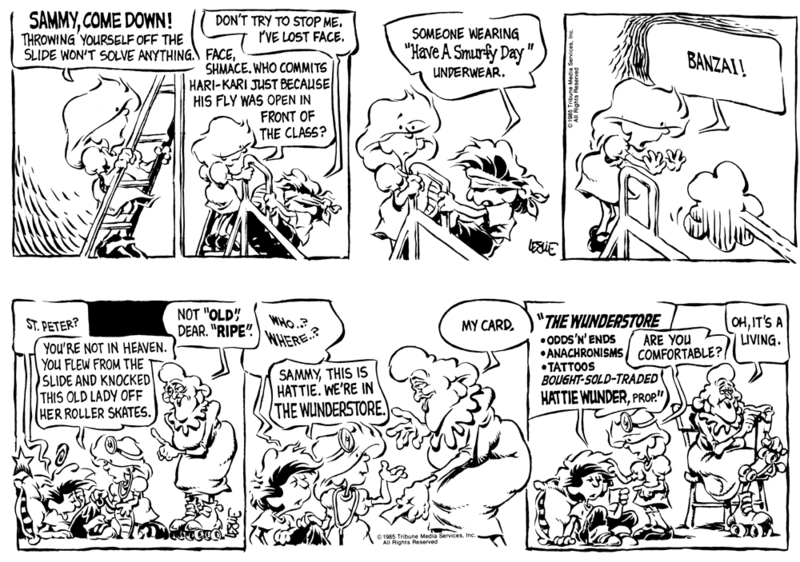 After H.M. the strip was unsigned for the last month of its existence. 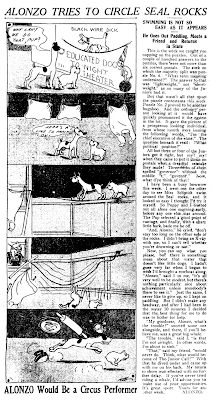 On November 2 1912 the final appearance of Alonzo was run in what was also the last Saturday kid's section of the Call. I think the most impressive thing about this frankly forgettable feature is that the quality, which granted was never stellar, was maintained at a decent level through a parade of seven cartoonists. The design of the character never went way off base and the cartooning was uniformly decent. That's no mean feat when cartoonists are playing musical chairs. Tomorrow: an Ink-Slinger Profile of Ralph Yardley, the originator of Alonzo. I think HM is illustrator HM Stoops, who drew some other call features around this time. He sometimes signed his work simply HM and sometimes HM Stoops. Here's on to be filed under "Unexplained Failures". 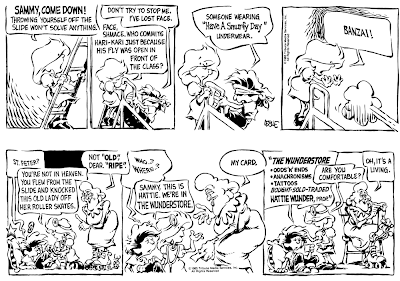 Tyler Two was a very well-drawn strip that featured a smart-mouthed, fantasy-prone kid, a neurotic single dad, and a small cast of generally solid supporting characters. The creator, Leslie Harris, had a wonderful drawing style that took full advantage of his space, and an ear for dialog and pacing that put across his punchlines with considerable verve. So why in the world did this strip come and go in 1985 with more stealth than a B-1 bomber? Ignoring the possibility that Leslie Harris (of whom I know nothing) decided to pack it in for a personal reason or a dispute with the syndicate, or that Tribune Media Services didn't promote the strip at all, I can come up with only a few dim possibilities. 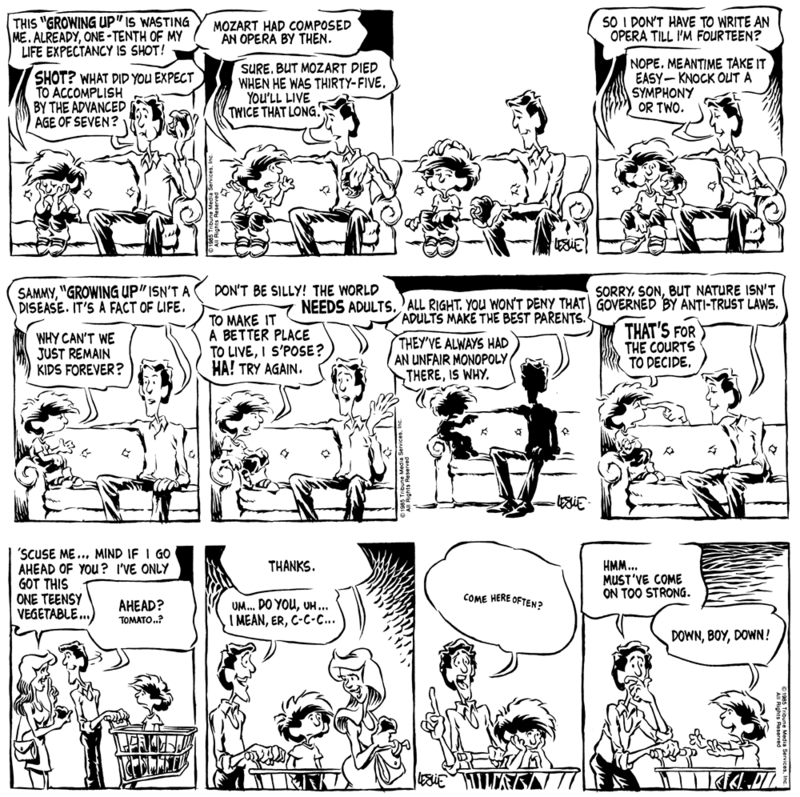 Could a strip about a single parent family have been still a little too touchy for newspaper editors at this time? They were the Reagan years, after all, when the 2.5 child, dual parent (one of each gender please) family unit was being heavily touted as the answer to all our problems. Or was it the frankly awful title? Tyler was the surname of our stars, and Tippecanoe their imaginary home city. Harris failed to point this out on anything like a regular basis (I had to read six weeks of dailies in the syndicate sales package to figure out to what the title referred), so was the obscure title the whole problem? A bad title is not to be sniffed at as a significant handicap -- look how long it took for Peanuts to catch on. Could it have been secondary character Hattie Wunder? She was one of those energetic, hip grandma types that we all had to suffer with over and over and over in the 1980s and 90s. I don't know about you, but those sprightly grannies drove me bonkers -- I would gladly consign every episode of Golden Girls to the flames of Hell with nary a second thought. Could it have been the occasional gag that would offend the grannies (you know, the actual, real grumpy ones, not the hipster TV sort)? I was surprised to find a gag referring to a "Honk if You're Horny" bumper sticker made the cut for the syndicate sales pack, for instance. Well, whatever it was that put the Mark of the Cancelled on Tyler Two, it seems like an unfortunate waste of talent. I can't even give you start and end dates. I can verify only that the Sunday ran at least June-August 1985. I've seen not one single daily printed in a newspaper; all the ones above are from the aforementioned syndicate sales package. I said up top that I know nothing about Lawrence Harris, but that's not strictly true. From the syndicate promo we have this scant information: "the 32-year old creator graduated with honors in fine arts from the University of Pennsylvania ... He smokes cigars and lives somewhere in modern America, which he knows very well." This description is accompanied by a moody, dramatically lit photo that looks like an LP liner pic of The Band member Robbie Robertson circa 1972. 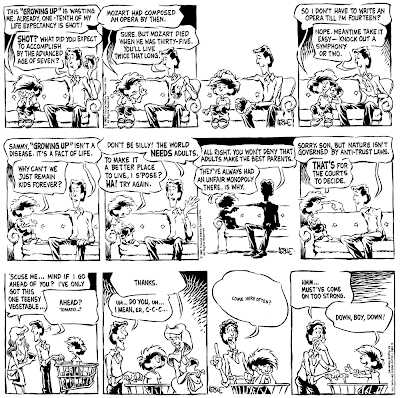 Don't you think that most papers carrying "Calvin and Hobbes" might have limited this strip to the smaller markets? As for feisty granny's, I love Diamond Lil. I would tend to agree with Michael. 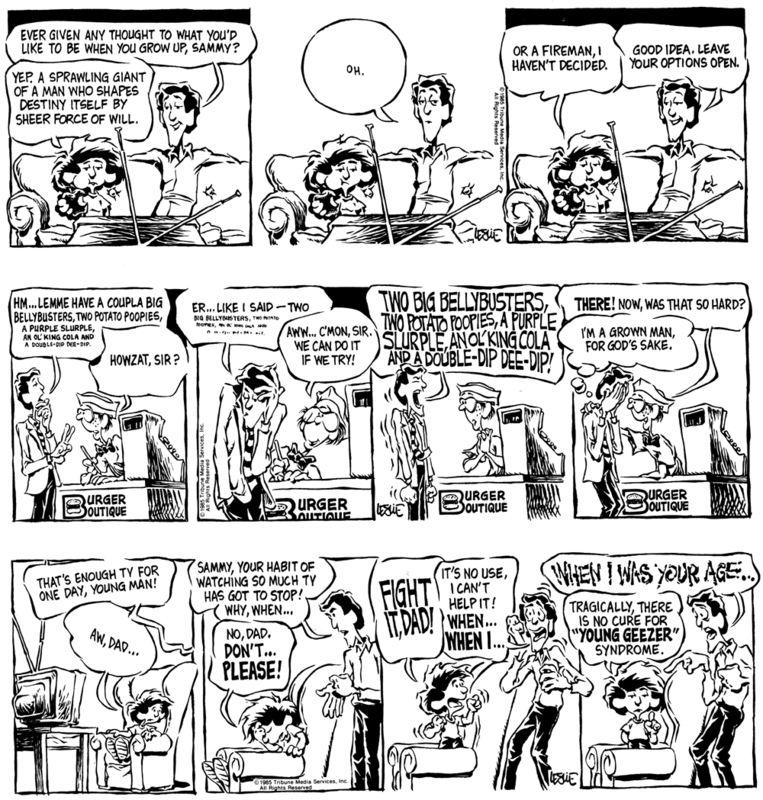 1985 was right around the time Calvin and Hobbes debuted, and it might have been too much competition. I too noticed that Calvin and Tyler had some surface commonalities. 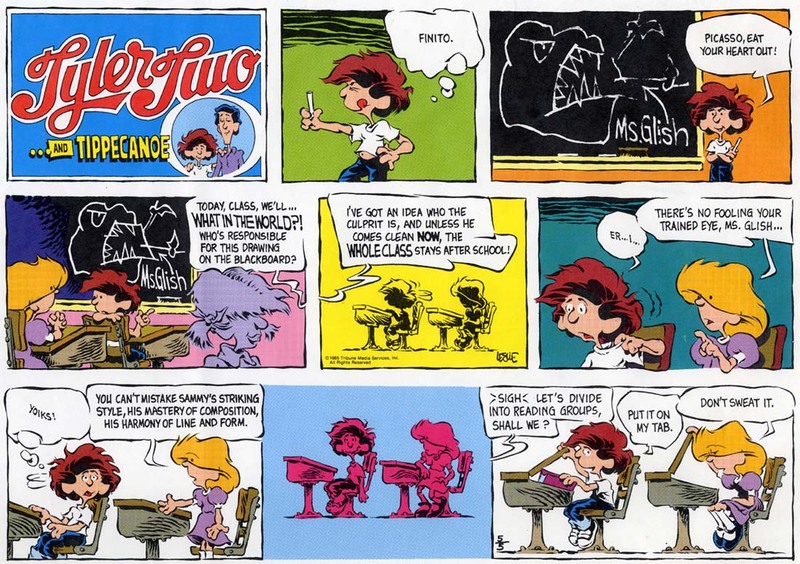 But Calvin probably didn't hurt the marketing of this strip because this one predates Calvin by at least five months. Presumably Tyler would have been making the sales rounds well before Calvin showed up on editor desks. He is Leslie Harris, originally from St. Louis Park, MN. (I went to hig school with him) Les lives in Atlanta these days. Illustrates graphic novels. Pedro M. "Pete" Llanuza was born in San Francisco, California on October 29, 1882, according to Who's Who in Chicago (1926). He was the son of Hernandez and Rita, and educated at the public schools. Information on his art training has not been found, and he has not been found in the 1900 U.S. Federal Census. Llanuza's name appeared several times in the Crocker-Langley San Francisco Directory; in 1902 he was a laborer and resided at 223 5th; in 1903 he was a machinist and resided at 226 Shipley; in 1904 he was an artist employed at F. J. Cooper, and resided at 265 1/2 Clementina. He had no listings in the 1905 and 1906 directories. 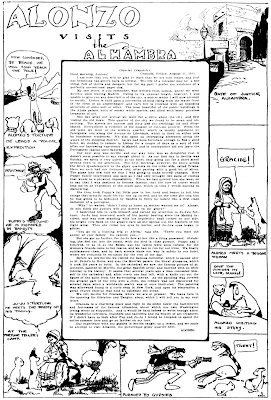 Who's Who in Chicago said Llanuza "began work on San Francisco Bulletin, 1906"; that year the earthquake and fire devastated San Francisco, so he "moved to Chicago same yr. and became connected with Chicago Examiner, later editorial cartoonist Chicago Inter-Ocean, sport cartoonist Chicago Record-Herald." The San Francisco Call (California) noted his brief return on November 18, 1909. Peter Llanuza, well known sports cartoonist and artist of the Chicago Record-Herald, and formerly a San Francisco newspaperman, is a visitor in San Francisco, and expects to remain in the city for two or three weeks. Llanuza arrived here Tuesday from the east and is staying at 349 Golden Gate avenue. Llanuza has not been found in the 1910 census. George W. French took over Llanuza's sports editorial panel on October 30, 1911. Llanuza may have moved back to San Francisco around that time. According to the 1920 census, he was married and had two daughters. The oldest one, Mildred, was 11 years old, so she may have been born in 1908 or 1909. Presumably he had married Cora some time in 1907 or 1908.
Who's Who in Chicago said Llanuza worked for the San Francisco Chronicle, a Hearst Syndicate newspaper. Once again he was listed in the Crocker-Langley San Francisco Directory; in 1912 the listing included his middle initial, "M", occupation as artist, and residence at 1242 Jones; in 1913 he was an artist at the Chronicle and lived at 1196 Ellis; in 1914 the listing was "Llanuza Pedro M (Cora) pencil and poster artist, 1005 Market, h 225 Downey"; in 1915 the listing was "Llanuza Pedro M (Cora) artist, 915 Van Ness Av". 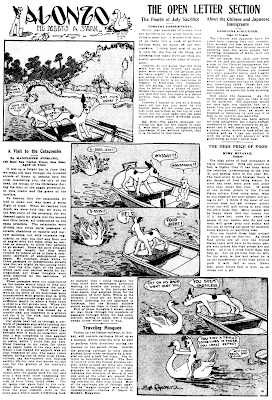 In 1913 the Chronicle published his strip, Jack Ofalltrades. A sample of the art can be viewed at Lambiek. The trade journal, The Pacific Printer and Publisher, Volume 14, 1915, mentioned Llanuza's studio in a profile of another local cartoonist. Cartoonist Frank Green, the new cartoonist of The Pacific Printer and Publisher, was born in Santa Rosa, Cal., on September 10, 1887, and after graduating from the local schools (when he was a friend of Roy Ripley, the now famous cartoonist, also of Santa Clara, now with the New York Times), he entered Mark Hopkins Art School (now the San Francisco Institute of Art) in 1904. He studied general illustrating and life class work, and received commendations on his ability in three lines. He left Hopkins at the time of the fire in 1906 and after four years spent in the study of cartooning, illustrating, etc., including a short time on the San Francisco Call, he went to Alaska. There he was engaged by the Alaska Citizen as cartoonist and etcher, and later the New Miner [illegible] his services. After two and one-half years spent in newspaper work and a study of mining life in the North, he returned to San Francisco, where he was engaged by the celebrated Llanuza Studio on Van Ness avenue. Six months spent with Llanuza doing cartoons, posters and portrait cartooning has brot [sic] him recognition along the line of commercial art in San Francisco…. Llanuza had no listings in the Crocker-Langley San Francisco Directory after 1915, so he may have moved around 1916. Who's Who in Chicago said Llanuza "returned to Chicago and was with Chicago Tribune". His portrait of actress Clara Kimball Young can be seen in The Sunday Tribune (Providence, Rhode Island) of May 20, 1917. 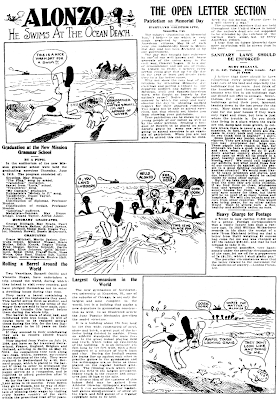 The Chicago Tribune promoted its newly expanded comics section in several newspapers including the Bugle Mansfield News (Ohio) on May 3, 1919; Llanuza's strip was mentioned. Beginning tomorrow the Comic Section of The Chicago Sunday Tribune will be enlarged to eight pages. Several new characters will be presented in addition to such old favorites as "Doc Yak" by Sidney Smith, "Mamma's Angel Child" by Penny Ross, and "Bobby Make-Believe" by Frank King. You'll find tomorrow's issue such new comics as "Mr. Bones" by Everrett Lowry, "Josephus Bugle" by Pete Llanuza and "Harold Teen" by Carl Ed. The enlarged eight-page Comic Section starting in tomorrow's Chicago Sunday Tribune represents more genuine humor—more costly features—more value! Pete Llanuza, a cartoonist, who is here making pictures, put on a gymnasium suit and boxed a round with each of the two principals. Pete is still alive, but he is having a hard job lifting his pencil. Dempsey caught him an accidental clout on the head and Pete got enough ideas for cartoons to last him the rest of his life. I prefer to get my ideas another way. In the 1920 census, his family lived in Chicago at 5236 Harrison Street. He was a newspaper artist. His youngest daughter, Marion, was four years old and born either in San Francisco or Chicago; she passed away before 1926. Two journals published in 1923, Office Appliances and Quarterly of the National Fire Protection Association, credited Llanuza as a Chicago Herald and Examiner cartoonist. Who's Who in Chicago said, "now  sport cartoonist Herald and Examiner; art editor and cartoonist Chicago Yacht Club, Chicago Topics, Chicago Night Life. Has caricatured many leaders of America and Europe; his studio regarded as one of the most unique and artistic in Chicago. Mem. No-Jury Soc. of Artists. Protestant. Clubs: Press, Chicago Yacht. Recreations: golf, boxing, yachting, motoring. Home: 10 E. Erie St. Address: Herald and Examiner." A description of his 1927 book, Aces I Have Known, is here. According to the Cook County, Illinois Birth Index and the Social Security Death Index, Llanuza's son, Don Pedro, was born on December 15, 1926. Evidently, the mother was not Cora. In 1930 his son lived with his maternal grandparents, Homer and Elizabeth Norton, in Chicago at 821 North Christiana Avenue. At the time, the Norton household included three of their five children. Their oldest daughter, Virginia, was ten years old in the 1920 census. Presumably Llanuza married her in 1926. He, Cora and Virginia have not been found in the 1930 census. Llanuza's heart was taken by Olive Belle Hamon in 1932. The Seattle Daily Times (Washington) published the story of her four suitors on September 18, 1932. The merry-go-round marriage mystery, who will wed Olive Belle Hamon, got dizzier today. Not only did the daughter of the murdered Jake Hamon, famous Oklahoma oil magnate, steal away from her mother to lunch with the young man of her heart's choice, but a third and then a fourth suitor entered the whirligig race. As the altar racers entered the stretch they lined up with Forrest C. Cross, 28 years old, still in front with a license to marry the girl; Pedro Llanuza, 52-year-old newspaper cartoonist, who tried vainly to get a license, still intent on marriage; a mysterious Larry, one on a self-confessed three-day drunk because he can't marry Olive Belle, known to the vaudeville stage as Loma worth, and a Manhattan physician, a hopeful outsider…. ...Cross, an ex-Marine, got a license to marry the blond and bejeweled Olive Belle Thursday, and Llanuza tried his best to get another license Friday, only to be balked because he did not have his divorce papers…. ..."I still think my little girl ought to marry Mr. Llanuza, although it is true he is very dictatorial—men are always that way," the mother said, reflectively. During the day she had some telephone conferences with Llanuza. The cartoonist was still intent on rushing the actress to the altar as soon as his divorce papers arrive from Illinois. Mrs. Worth said that over the week-end she intended to have Llanuza meet Cross so that they could discuss their common interests. None of the suitors were chosen. If Llanuza really was 52 years old, as reported, then he would have been born in 1880 not 1882, as previously written. Later, Vic Forsythe's strip, Joe Jinks, was continued by Llanuza from 1933 to 1936. The Meriden Daily Journal (Connecticut) reported, on June 22, 1936, Llanuza's lawsuit against five Hollywood animated-cartoon companies. In December 1941, ads appeared in various newspapers, such as the Kokomo Tribune (Indiana), announcing "Chicago's new morning newspaper, The Chicago Sun". The ad touted its cartoonists. Charles E. Werner will be The Sun's political cartoonist; a Pulitzer Prize winner in 1938—always worth watching. Jack Lambert, who sculptures his cartoons, and Pedro Llanuza, famous caricaturist, will also be staff contributors. Llanuza signed his World War II draft card on April 27, 1942. He lived in Chicago at 53 East Superior Street, and named George Dewitt, of the Chicago Sun, as his contact person. Two items stand out, his age, 47, and birth date, October 29, 1894. Why he made himself 12 years younger is not known. Llanuza passed away on March 28, 1943 in Chicago, according to the Cook County, Illinois Death Index. His tragic death was highlighted in the headline and sub-heads of the Chicago Daily Tribune story of March 29. If anyone has access to ProQuest, please help us with details of the Tribune story. According to the Wisconsin Death Index his first wife, Cora, passed away on February 7, 1975. His artistic son, Don, died on December 30, 2006. Regarding Llanuza's ethnicity, two books offer different claims. He is Italian in The Big Book of Italian-American Culture (HarperPerennial, 1990). Collier's Encyclopedia with Bibliography and Index, Volume 5 (1984 and 1993) said, "A Mexican, Pete Llanuza, signed on with the Telegram in the mid-1920's, and many modern cartoonists acknowledge a debt to him. He was more of a caricaturist than most, and knew almost nothing about sports. But he had style, fine drawing ability and originality." Josephus Bugle had a very short run -- not because it was was a bad strip, just ill-timed. 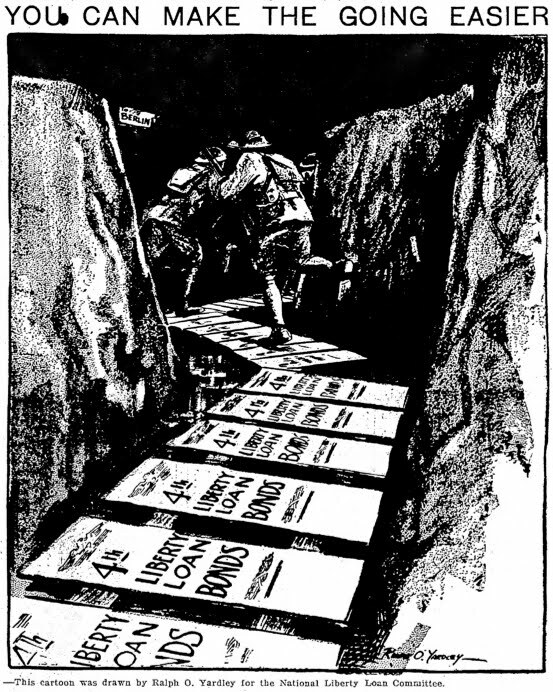 When World War I ended in November 1918, a lot of papers were caught flat-footed holding war-themed material. Some of it got dumped, but a lot of it ended up being published, sometimes slightly re-jiggered to reflect the new situation. Luckily, anything that didn't actually show doughboys under fire could be run pretty much as is, because American soldiers remained in Europe by the thousands until well into 1919. As you can imagine, it was a task of Herculean proportions to shut down operations and get all those fellows back across the Atlantic. Josephus Bugle bears the mark of having been produced while the war was still being fought. The star of the show was a hyper-patriotic fellow who wanted to do anything he could to assist in the war effort on the home front. Never mind that there wasn't a war anymore by the time the strips actually ran. There was, after all, still plenty of work to be done apres la guerre. 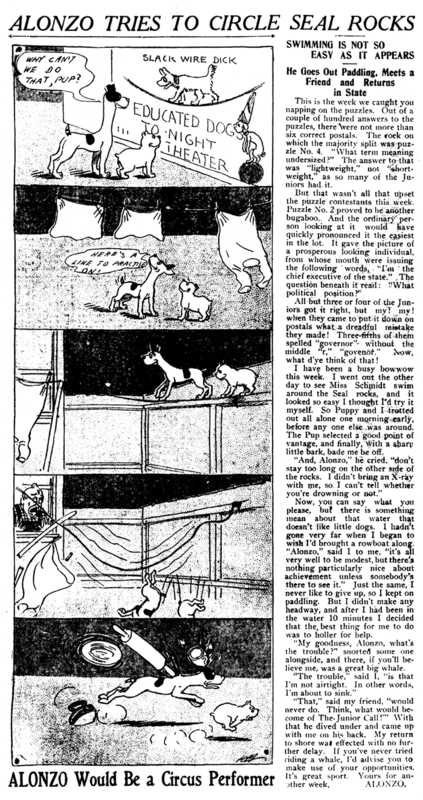 So the Chicago Tribune, which probably gave cartoonist Pete Llanuza the green light to start producing a Sunday page of Josephus Bugle in late 1918, ended up running the even dozen produced episodes of the strip from May 4 to July 20 1919. They probably didn't have much choice. 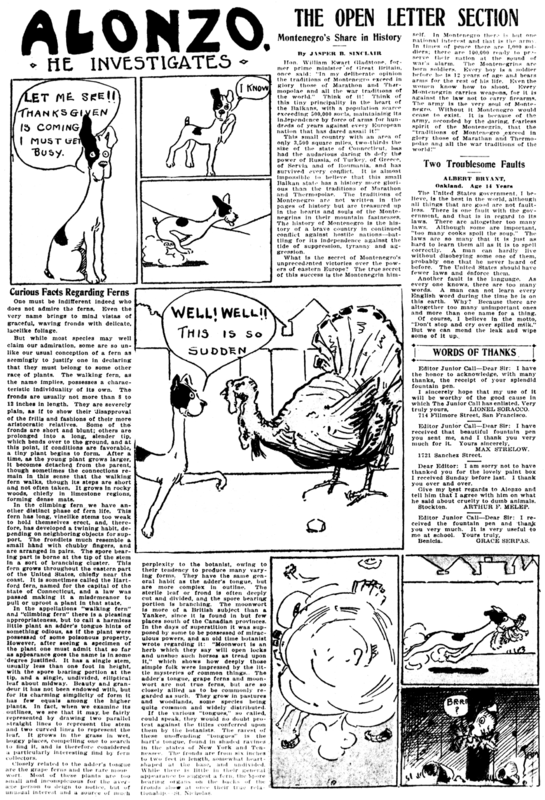 The Tribune inaugurated a new enlarged Sunday comics section on May 4, growing from four to eight pages, and they needed material. Apparently Josephus Bugle had been earmarked for the expanded section for quite some time. As soon as the dozen Josephus Bugle strips were used up, Llanuza started a new strip for the enlarged section. His new strip also had a very short life, but that's a subject for another day. Another strip caught by the sudden end of the war was Walter Allman's Doings Of the Duffs, over at NEA. 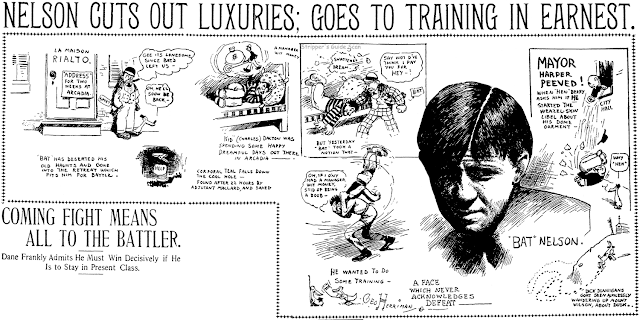 Wilbur Duff finally joins up, and spends a lot of 1918 in training camp. He was finally ready for duty "over There", but the war ended while he was on a troop ship in the middle of the Atlantic, and so we never got any battle stories. Something tells me that Jim has some limericks to share. Well, bring 'em on!